The U.S. Food and Drug Administration and the U.S. Environmental Protection Agency issued a joint “Federal Advisory for Mercury in Fish” for fish you buy at stores and restaurants. The federal advisory can be found online at https://www.fda.gov/food/foodborneillnesscontaminants/metals/ucm351781.htm. OEHHA gives special guidelines for women ages 18-45 years and children 1-17 years because children and fetuses are more sensitive to chemicals. Women over 45 years and men have less risk and can safely eat more fish, as shown in the following tables. The consumption guidelines in the tables are based on the chemicals noted in each table. Fish consumption recommendations in the following tables are provided as the number of servings per week. 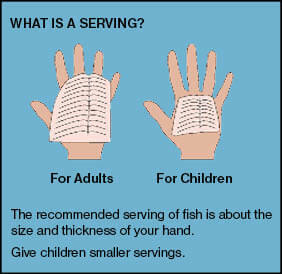 A serving is about the size and thickness of your hand. Give children smaller servings. The guidelines for each species and area assume that no other fish are being eaten in the same week. 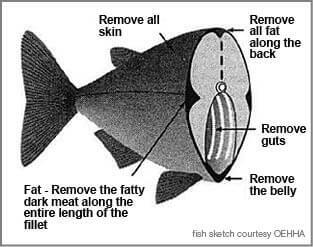 These safe eating guidelines are for fish from marine and anadromous waters only. OEHHA’s guidelines for freshwater fish can be found in the CDFW’s Freshwater Sport Fishing regulations booklet, available wherever sport fishing licenses are sold, at your local CDFW office, and online at wildlife.ca.gov/regulations. If you do not see your specific location in these tables, follow OEHHA’s Eating Fish from California Coastal Locations Without Site-Specific Advice located online at oehha.ca.gov/advisories/statewide-advisory-eating-fish-california-coastal-locations-without-site-specific-advice or OEHHA’s Advisory for Fish that Migrate located online at oehha.ca.gov/advisories/advisory-fish-migrate. This advisory does not apply to commercially grown Tomales Bay oysters, clams, and mussels, which do not contain high levels of mercury. Do not combine recommendations. For example, if you eat three servings of striped mullet, do not eat any more fish until the following week. Do not combine recommendations. For example, if you eat one serving of Pacific chub mackerel, do not eat any more fish until the following week. Because of high concentrations of dieldrin or DDTs or both, OEHHA recommends that no one eat fish from the Lauritzen Channel in Richmond Inner Harbor. Do not combine recommendations. For example, if you eat one serving of kelp bass, do not eat any more fish until the following week. Do not combine recommendations. For example, if you eat one serving of California corbina, do not eat any more fish until the following week.